How the second-generation rocket fighter almost was. The nuclear wielding bomber became an infinite threat after WW2 when Russia invented their own bomb. Getting to 50,000 feet and meeting a 500mph target became supremely important. But how? Reach altitude. Catch it at faster speeds and maneuver for attack. First-generation Jet engines weren’t yet capable. It already had a head start. Powerful Rockets? Now there’s an idea. At the time this threat was realized, the world had only developed first-generation jet technology and had yet to introduce anything close to the next generation. 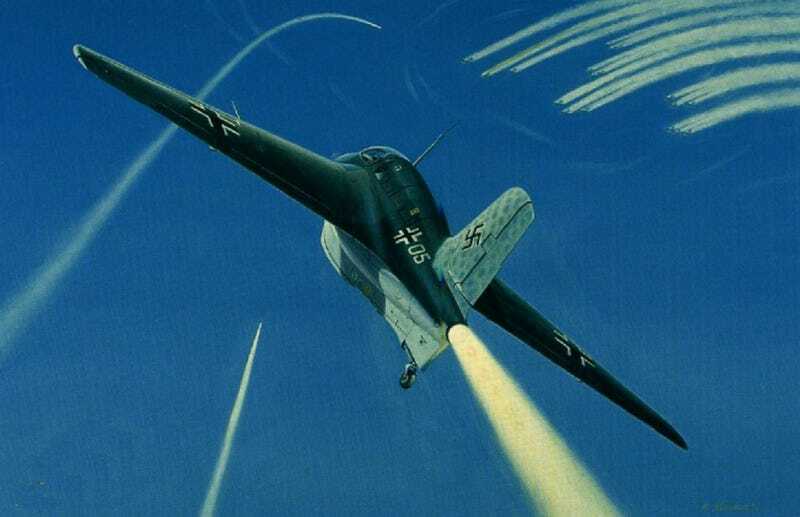 The Me-163 Komet in WW2 could launch and intercept a B-17 at 30,000+ feet. Now, the delivery would be at 50,000 feet and almost twice as fast as the B-17. Not a single fighter would be capable of that action until sometime near the 60's. Not even a Komet. Europe needed something that could do it, and fast. This began a specification to solve the issue. The British Air Ministry issued Operational Requirement 301 of February 1952: “Rocket propelled interceptor” It decreed rocket propulsion to reach the threat and a jet engine to fly it back to base. Crazy? Well there was no other option to solve the problem. The Saunders Rowe SR.53 was the first example of this design in practice. It was to test the design concepts of mixed propulsion and operation. It had a 5,000 pound thrust rocket engine and a Rolls Royce Viper turbojet of 1,600 more. The hydrogen peroxide rocket fuel was much safer than Liquid Oxygen at this stage and at high altitude, it didn’t suffer any performance falloff like a jet. After many setbacks and delays, a pair of them finally began testing. The tests indicated a very stable and pleasant aircraft. They reached Mach 1.3+ in the program. They began developing the SR.177 shortly thereafter, a much larger and more capable version that would truly dominate the interceptor role. This plane would solve Europe’s problem. England and Germany were all about it. Until, 1960. By this time, rapid engine technology made after-burning turbojet engines up to three times more powerful than an F-86. But Lockheed kinda screwed it all up for Saunders Rowe. Lockheed’s F-104 sales team, whose plane first flew in 1954 but was starting to loose favor with the U.S., had been aggressively shopping around an export version so they could actually see a profit on it. They had bribed anyone and everything to get a sale and made a fortune doing so, making sales upon sales. West Germany, Italy, the Netherlands and Japan had all been on the take and although the Sr.53 was on it’s deathbed due to a 1957 paper devoting all future funds to ballistic and surface to air missile development, the final nail was Germany’s decision to buy the F-104 in their interceptor role, as well as for every other multi-role they could think if. Subsequently, the F-104 safety record in these roles was horrible and hundreds died in training accidents. It was not an easy plane when slow. A testing accident in 1957 made it easy to cancel the program. Surface to air missile technology on the way would definitely have shortly ended the concept anyway even if they did go ahead with production. Gary Powers was shot down in 1960 by missiles that could hit at over 65,000 feet, so the technology, awesome as it was, had become obsolete before it could be realized.